Two HBP/bat-contact plays produced differing replay results on Monday, when umpires in Miami and Houston encountered two attempted Manager's Challenges on plays at the bat. Read along to find out why one play was reviewable while the other was not. MIAMI: With none out and none on in the top of the 2nd inning of the Rockies-Marlins game, Rockies batter Trevor Story swung at and attempted to hit a 3-2 fastball from Marlins pitcher Paul Clemens, ruled a foul ball by HP Umpire Ron Kulpa. Marlins Manager Don Mattingly alleged Story's bat failed to contact the baseball and that the ball instead hit Story's shoulder, opting to file a Manager's Challenge. 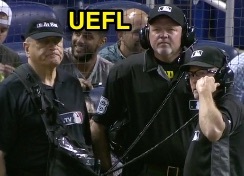 After Crew Chief Jerry Meals consulted Replay HQ, he ruled the play was not reviewable and Mattingly was not charged with a challenge (Replay Regulation V: "If a Manager challenges a call that is not eligible for review, the Crew Chief will inform him that the call is not reviewable, and the Club shall not be charged with a challenge"): the game resumed with a 3-2 count, and the foul ball call stood. Replays indicate the ball missed Story's bat and instead hit his shoulder, the call was incorrect (yet not reviewable). 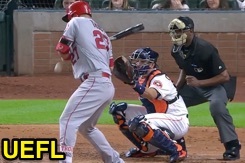 HOUSTON: With two out and one on (R3) in the top of the 3rd inning of the Angels-Astros, Angels batter Mike Trout attempted to avoid being hit by a 3-2 fastball from Astros pitcher Doug Fister, ruled a hit-by-pitch by HP Umpire Ramon DeJesus. Astros Manager AJ Hinch alleged Trout's bat contacted the baseball and projected it into fair territory, opting to file a Manager's Challenge. Upon Replay Review, the call was overturned to a groundout as replays indicate the pitched ball struck the knob of Trout's bat and never touched his person. The difference between these two similar plays concerns one—and only one—aspect: the batter's intent. In Miami, Story clearly swung at the pitch, whereas in Houston, Trout had no such intent. (See Replay Review Regulation V.G "Hit By Pitch. Those plays for which there is a possibility that a pitched ball touches a batter, or his clothing.") For this reason, the Miami play was not reviewable and the Houston play was reviewable. Even though in Houston, the end result was a batted ball and groundout, the only reason the play was reviewable to begin with is because of the possibility the play could have been ruled a hit-by-pitch. Yet in Miami, it was ruled that a hit-by-pitch was not possible and, therefore, the play was not reviewed.